It's a safe bet that the Nobel Prize–winning chemist and peace activist Linus Pauling didn't arrive at all of his good ideas by remaining silent. Chances are very good that there was a lot of talk going on at his Caltech lab as he and his colleagues worked out the problem of electronegativity and its relationship to ionic bonds between atoms. (Talk about academic discourse!) Of course, this didn't occur in an unruly or chaotic environment; the learning goals and social rules of conversations were just as important there as in any classroom. As educators, we know that learning is social and that peer interactions help extend understanding. The idea that peers can scaffold new learning effectively for one another was one of Lev Vygotsky's great contributions to our field. Yet many teachers are reluctant to turn the class over to collaborative learning, for fear that they will lose control and thus lose valuable instructional time. We don't base this claim on observation alone. A study of the experiences of 1,000 elementary students across the United States found that they spent 91 percent of their days in either whole-group or independent seatwork, with only 4.8 percent engaged with peers in a learning activity (Pianta, Belsky, Houts, & Morrison, 2007). It isn't for lack of teacher knowledge, either, as 90 percent of the teachers held a credential, and 44 percent possessed a master's degree. As we have stated throughout this book, English language learners need lots of opportunities to apply their growing knowledge in order to learn English and learn in English. Their acquisition of academic language is certainly initiated through the modeling of teachers and reinforced and extended through classroom discourse. In addition, teachers provide more specific supports during small-group guided instruction. This approach does have its limits, however. For example, Zwiers's (2007) study of the practices of middle school teachers found that in too many cases the questions they posed to English language learners differed in complexity (concrete versus abstract) and the teachers accepted more superficial answers from these students than they did from native speakers in the same class. Zwiers posited that students who speak English as a first language arrive in school with a higher "academic capital" that allows them to speak a school type of language that is valued (2007, p. 94). Therefore, they are more adept at using the discourse of comparing and contrasting, interpretation, evaluation, and description. But many English language learners, especially those at the secondary level, report that they have limited opportunities to interact with native speakers in their classes and that this is a factor in the separateness between the two student groups (Daoud & Quiocho, 2005). Although we believe a strong research base exists for creating opportunities for students to work together, we also recognize the reluctance many teachers have about using such an approach. Some have concerns about management—a fear of the proverbial cocktail party breaking out and an exhausting attempt to restore order—and some labor under the misconception that real learning can occur only under a teacher's direct instruction. In the following section, we will describe a set of principles for managing academic discourse among peers and specific strategies that foster learning English while learning in English. The talk of the classroom is necessarily academic in nature and includes a variety of cognitive functions that help students explain their thinking and learn from others. For instance, students need to be able to compare and contrast ideas, ask questions, and describe phenomena. We find it useful to provide sentence starters related to the different types of thinking necessary in any learning environment. We post these sentence starters around the room and refer to them during guided instruction. In addition, we remind students of the language objectives for the types of language they will use in their collaborative learning activity. A copy of the poster we use in our classes appears in Figure 5.1. "The first step is …"
"The last part is …"
"I still have a question about …"
"What I learned is …"
"Here is something they both have in common …"
"These are different from each other because …"
"This is an example of …"
"This is important because …"
"The parts of this include …"
"We can make a diagram of this." "I can predict that …"
"I believe that _________ will happen because …"
"What might happen if …?" "The answer is because …"
"I agree with this because …"
"A better solution would be …"
"The factors that are most important are …"
When students are learning a new language, their receptive skills typically develop in advance of their productive skills. English language learners may indeed understand the discussion in a classroom, but they may have difficulty finding the language they need to express the depth and complexity of their thinking. Using sentence frames can relieve the linguistic load, allowing students to focus on the content while they practice academic language. Some educators may argue that this framing of language results in shallow and contrived discourse, stifling critical thinking. And indeed, when students first begin to use these frames, their language will likely sound stilted and rehearsed. But then, isn't that the natural progression of learning any new skill? First we watch, then we mimic, and then we begin to appropriate, adjusting our use of the skill to suit our own style. Linguistic frames serve as a way to scaffold and differentiate both oral and written tasks for students at different levels of language proficiency. In this way we make the register, the style, and the word choice explicit, identifying the rhetorical moves that are appropriate to the purpose and the context and helping students make their meaning clear. Linguistic frames can be used at any level—from beginning language learners to native speakers, from kindergartners to adolescents. Harvard University education professor and author Howard Gardner even asks postdoctoral fellowship applicants to use them to guide their responses: "Most scholars in the field believe _______" and "As a result of my study, ________" (Graff & Birkenstein, 2006). Examples of linguistic frames related to cause and effect can be found in Figure 5.2. The academic language of the speaker is only one side of the equation—the listener also has responsibilities. Beyond basic social expectations regarding polite behavior, true discussion needs the active participation of others if there is to be an exchange of ideas. Lauren Resnick (1995) introduced the concept of accountable talk as a means of raising the level of academic discourse among students. Accountable talk governs the norms of academic discourse and requires that students ask for and furnish evidence to support their statements (Michaels, O'Conner, Hall, & Resnick, 2002). 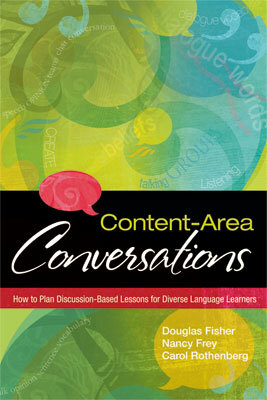 This ensures rigor and moves the conversation from task-oriented to concept-oriented learning. In a classroom filled with accountable talk, students ask one another about their thinking and build on the responses of others. They cite evidence, ask for elaborations and clarifications, and extend understandings by using the statements they have heard from their classmates to form new ideas. We place a table card on each group's desk at the start of each collaborative learning activity to reinforce the need for holding oneself (and each other) accountable for rigorous discussion (see Figure 5.3). Ask questions when you don't understand a topic. This reminds me of ______ because _____. I believe this is true because __________. Ask for evidence when something sounds incorrect. I'm not sure that's right. Can you tell me why you think it is true? Can you show me a place in the book that illustrates that idea? Give evidence to support your statements. Read a passage from the book that illustrates your idea. Bring another information source to support your idea. Use ideas from others to add to your own. I agree with _______ because _______. ______'s idea reminds me of ________. Kristina: Well, I know they touch. Kristina: 'Cause I seen them wave their—their—what are those pointers on their heads? Kristina: Yeah, antennae. They use their antennae to touch each other. Roberto: The eyes is here [points to label that reads "eyes"]. Ting: Look how teeny they are. They must not see a lot of stuff. This is a typical accountable talk interaction among young children and is all the more remarkable because it doesn't sound contrived. They still think and speak as 7-year-olds, but the difference is that they are listening to one another instead of speaking in parallel. In addition, the conversation hasn't wandered from the topic, because the students are accustomed to working together like this. Taken together, the language goals and accountable talk guide the academic discourse of the group, without imposing an artificial structure that limits students' thinking. Of course, these four students didn't end up together through happenstance. Ms. Hirano created a heterogeneous group of students with varied content knowledge, language proficiency, and social styles. In the next section, we will discuss grouping considerations for managing talk in the classroom. Although there may be a certain surface logic to grouping students homogeneously, the preponderance of the evidence shows that students of all abilities perform better in heterogeneous groups (Lou et al., 1996). It comes as no surprise that low-achieving students do worse in homogeneous groups because they collectively have fewer resources to draw from (r = -.60). There is a very small positive effect for high-achieving students when grouped homogeneously (.09), but average-achieving students benefit significantly (.51) from mixed-ability grouping (Lou et al., 1996). The composition of the members plays a role in the relative success of a group. Bennett and Cass (1988) looked at the performance of groups where either the high-achieving students outnumbered the low-achieving ones or vice versa. They concluded that groups that were dominated by high-achieving students performed worse because the low-achieving student was left out of the process. This did not occur when high-achieving students were the minority in the group. A formula of two low-achieving students for every one high-achiever or two English language learners for every one proficient speaker may not be feasible for every classroom, but it is worth noting so as not to inadvertently set up groups that leave learners behind. Language proficiency level: Students may be grouped together for a language lesson or heterogeneously to provide language models and facilitate sustained conversation. Primary language: Students work with others who speak the same language, allowing them to discuss new and complex topics in a familiar language. Skills development: Students are grouped together because they are working on the same skill. Interest: Students study a shared topic of interest or are spread among groups to serve as motivators. Work habits: Students are spread among groups to model work habits. Prior knowledge of content: Students are grouped to share topical knowledge. Prior knowledge of strategies: Students are organized to share strategic knowledge. Task or activity: Students are grouped together because the task or activity has been designed to meet their needs. Social: Students are spread among groups to serve as leaders or in other specialized roles. Random: Random grouping ensures that students come into contact with all members of the class and build community. Student choice: This pattern gives friends an opportunity to work together (Flood, Lapp, Flood, & Nagel, 1992). To form effective groups, you must know your students well. When your classroom includes English language learners, you must be keenly aware of their proficiency levels in English as well as their understanding of the content of the task. Placing one student who is new to English in a group of proficient students may seem like a good idea, but in actuality, that student is likely to participate more with students whose level of proficiency in English is closer to his or her own: the English language learner will not feel as intimidated, and the other students may have more empathy and understanding of how the student feels. And, although it can be helpful to assign a buddy to a student who has just arrived with no English, be careful that the buddy does not do all the work and become a caretaker. Rotating buddies periodically relieves the burden of being the "teacher" and helps the new student get to know more members of the class. Obviously, the ability to group and regroup students depending on the purpose of the task requires a physical arrangement of the room that facilitates movement. In Chapter 4, we saw how two different teachers organized their classrooms to allow for this flexibility. In some classrooms, the only solution to flexible grouping is to ask students to physically move their desks or chairs. At first glance, this activity may seem like an invitation to bedlam that takes valuable time away from instruction, but with a bit of guidance, students can learn to do this quickly and efficiently. Students, especially those in elementary school, express a preference for working in mixed-ability groups (Elbaum, Schumm, & Vaughn, 1997). Students identified as gifted and talented in grades 5–11 acknowledged the social development benefits of working in heterogeneous groups (Adams-Byers, Whitseel, & Moon, 2004). When collaboration with peers becomes routine rather than anomalous, students settle into a pattern of work that is productive without being disruptive. Of course, managing noise and time also contributes to the smooth operation of the class. We believe that mismanagement of noise and time poses the biggest barrier to teachers' use of collaborative learning and goes a long way toward explaining the dearth of partner and small-group work in classrooms. Although school administrators understand that a quiet classroom does not necessarily equate to a learning classroom, most of us worry that the hum of activity could devolve into the clamor of chaos and that our teaching reputations will be sullied in the process. This concern may be especially true for new teachers, who know they are under scrutiny and don't want anyone to think they have classroom management problems. Even the best-designed collaborative task can be diminished by poor procedures that fail to take noise and time into account. This activity is a great way to teach about volume and musical dynamics. We pair it with a visual representation of the volume using a noise meter (see Figure 5.4). There's nothing fancy about this aid—it is made using a large piece of corrugated cardboard, and the arrow is attached using a brad. We introduce the vocabulary terms silent, quiet, moderate, elevated, and outdoor voice and simulate those levels using the song. Older elementary students don't need the song, so instead we use a lamp with a dimmer switch—the lower the light, the quieter the class is expected to be. We practice being silent for 56 seconds, or working quietly for 24 seconds, or speaking moderately for 38 seconds, so that students gain tangible experience with understanding the relative levels of sound. We then tell our students that we will use these noise levels through our school year: silent when we are taking tests, quiet when working or reading independently, moderate—defined as loud enough to be heard by your partner but quiet enough not to interfere with another pair's conversation—when engaged in partner talk, and elevated only during small-group work. Of course, we never use an outdoor voice inside the classroom! The noise meter is introduced on the first day of school and is revisited each time we move into independent work, collaborative learning, and guided instruction. Before long, the visual cue is no longer needed, and the verbal direction alone suffices. When the noise level does get too loud, we stop the class and redirect attention to the noise meter. We have seen other colleagues use variations of the noise meter, like a traffic light or a large "noise thermometer" with a red ribbon representing the mercury inside the tube. One of our secondary science colleagues begins the year by teaching students about the science of acoustics and the effects of noise on learning. The common denominator in all of these examples is drawing students' attention to sound levels in the classroom and giving them an active role in monitoring it. As we discussed in Chapter 3, releasing responsibility to students to talk with each other and construct their own meaning takes more time than simply telling them what we want them to know and asking a few questions of a few students to assess their understanding. It becomes particularly important, therefore, that we manage time effectively. By the time children are 8 years old, they show time-monitoring patterns that are similar to those of adults (Mäntylä, Carelli, & Forman, 2007). The rate at which they check clocks increases as time elapses, with fewer checks early on in a task. However, students aren't always as good at figuring out how much time is left. Setting a bell to ring at the end of an activity gets their attention, but it doesn't allow them to adjust their rate to meet the time requirements. A simple solution is to provide students with a means to monitor the time remaining. Countdown timers can be displayed using an overhead or a projector. In the absence of this kind of device, you can post descending numbers of variable intervals on the board and cross each off as the time elapses. For example, in a 15-minute assignment, post the numbers 13, 10, 7, 5, 3, 2, and 1 to reflect the increased clock checking that students will do. An added benefit of an overhead timer or chalkboard countdown is that it helps the teacher monitor time as well. Noise and time management aside, another challenge in using effective collaborative tasks is how to ensure that all students are actively engaged in learning. One common fear is that students will spend their time talking about topics that have nothing to do with the task at hand. There are also the issues of certain students dominating and doing all the work and of students who prefer to work independently. When we add in the elements of linguistic and cultural diversity, we add another dimension to the complexities of managing oral discourse in the classroom. Here again, purposeful and structured planning, along with teacher guidance and support, can maximize participation and learning for all students. For obvious reasons, it can be particularly uncomfortable for teachers when students are talking together in a language that the teacher does not speak. Using the primary language in the classroom, whether it is the teacher speaking or students, is a somewhat controversial practice. On one side of the argument are those who believe that students must use English to learn English and that time not spent in English is valuable learning time lost. They argue that, for many students, class time is the only time they are speaking English, because they may go home to communities where there is no need to do so. We wholeheartedly agree that one of the primary goals for our students is proficiency in English, but one of our other primary goals is understanding of grade-level content, which includes progressively more and more difficult concepts as students move up the grade levels. Consider for a moment this scenario. You are in a class as a learner, studying a subject you are unfamiliar with—perhaps stoichiometry, tessellations, or corpus linguistics. Would you prefer to discuss these new ideas in your native language or in a new language that you are learning—say, Russian, Portuguese, or Amharic? Language choice, like grouping, depends on the purpose. There may be times when students will learn more if they can talk about new and difficult concepts in familiar language. Of course, we want to be sure they are talking about the new concept and that they are on the right track. So how do we do this? First, when we have created the type of environment we described in Chapter 4, where students understand the purpose of talk, are used to talking, and know that their ideas are important, we can trust that students will value the time to discuss and clarify their understanding. Will they do so 100 percent of the time? Perhaps not, though we would argue that the percent of time on task is not proportional to which language students are using. Second, we can monitor student talk in a language other than English in the same way we monitor students speaking in English, by sitting with the group and asking questions, in English, to gauge their understanding. They must respond in English, which gives them the opportunity to use the language and vocabulary we expect them to use, with the added support of having first had an opportunity to clarify their thinking in a familiar language. Finally, accountability is built into all collaborative tasks. Teachers may require students to complete a graphic organizer, write a summary, create a skit, or present their conclusions to the class. Even when we require students to complete and turn in a written product as part of their collaborative work, this task does not necessarily translate into engagement for all students. Without careful organization, one or two students can end up doing all the work. In the last chapter, we talked about how to teach students to share responsibility, contributing to the discussion and encouraging others to participate as well. In addition to teaching them about the importance of participation in group work, it can be helpful to set up systems and structures that require all students to participate. We often see group work organized such that each student has a role. One student might be assigned to be the recorder; another, the facilitator; another, the questioner; and the fourth, the timekeeper. Unfortunately, all too often, it is the English language learner, the student who may be most in need of language practice, who is assigned the role of timekeeper—a role that requires little or no language and certainly no interaction with the content. Moreover, it is not even a necessary role; as we've already noted, there are other ways to help students manage their time. This is not to say that students should never be assigned roles. In Chapter 3, we saw Mr. Barber assign roles quite effectively when his students were first learning to do reciprocal teaching. The difference is that in that case, each role is equally important in making meaning. Mr. Barber's expectation is also that students will practice all roles and eventually, as they become more comfortable with the process, will no longer need to be assigned roles. One way of assuring that all students participate and learn is a collaborative structure called "numbered heads together" (Kagan, 1992). Each group is assigned a number, and each student within the group is assigned a number from 1 to 4 (or 5 when the numbers don't work out evenly to 4). The teacher asks a question and tells students to make sure every student in the group can answer the question. After a predetermined amount of time, usually a minute or two or more, the teacher spins the overhead spinner and announces the number of the student who must answer, perhaps number 3. Groups then have one more minute to make sure that student number 3 in their group can answer the question. The teacher spins again and announces the number of the group that must respond. In this way, students support each other to make sure they all can answer because they never know who will be called on. This strategy is most effective when groups earn points for correct responses. The other major problem with assigning roles is that only one student is the writer. We prefer to see that all students are required to write their own copies, whether of notes, a skit, or a graphic organizer. Obviously, when the task is to create a poster, this is not so simple. Later in this chapter, you will see how Ms. Chang builds in accountability as her students create a collaborative poster. Each student in the group selects a different colored pen, and all colors must appear on the poster in relatively equal amounts. (She uses this meaning of equality as an opportunity to reinforce understanding of percentage in her math class.) Ms. Chang also insists that, regardless of who is the best artist or who has the best handwriting in the group, all must do both writing and drawing on the poster. Once we've resolved the issue of all students contributing to the creation of the product, we are left with the question of how to ensure that all students contribute to its presentation. Even when students have written a dialogue—say, to represent the main ideas and events of the westward movement—it may not have a part for all four students. Because we want all our students to practice speaking in more formal situations, we ask that all students present the dialogue even if it means that two students will recite one part chorally. If they are presenting a poster, we give them time to determine how they will organize their presentation so that all group members play an equally important role. Another challenge to managing effective group work can be norms of behavior, whether they are individual differences in personality or more general differences in cultural practices. In some cultures it is considered inappropriate for boys and girls to work together. Students from other cultures may be used to working independently and may be uncomfortable working in a group. Because we live in a society where people work together at some point in virtually all careers and walks of life, it is important for students to be able to step outside this comfort zone and engage in whatever configuration they may find themselves. Teaching students to participate effectively while still recognizing, valuing, and allowing for these differences can be a delicate balance. As we create an environment that fosters teamwork, we can hold frank discussions about cultural and personal differences and the reasons for learning to work both independently and collaboratively. We can also vary the structures for learning, sometimes grouping girls with girls and boys with boys, for example. And for those students who prefer to work independently, we can negotiate with them, allowing them to work independently for part of a project or for certain projects and progressively moving them into more collaborative situations. In Chapter 3, we discussed the importance of making the purpose of each lesson clear to students in order to focus their attention and help to build schemas and understanding. Setting clear expectations and outcomes is also an important factor in managing group work effectively. Many of us have had the unfortunate experience of designing what we thought was an exciting and interesting collaborative task for our students, only to watch it go over like the proverbial lead balloon. Upon reflection, we may realize that the reason for the failure was not so much the lesson design but that students did not understand what we expected them to do. Asking students to work together is far more complicated than simply assigning the odd-numbered questions at the end of the chapter. It requires making the procedures of the task as well as the expectations for quality and substance of the outcome crystal clear for all students. This may mean showing models of completed work, writing the directions in addition to telling the students what to do, or modeling how to do the task (as we saw with the fishbowl). Posters of the steps involved in each collaborative task are one way of helping students learn what they are supposed to do. Mr. Lopez, a 2nd grade teacher, and Ms. King, a 10th grade world history teacher, both use the same procedures to make sure students know what the assignment is. They write the steps of the task on an overhead or chart, tell the students what they will be doing, and then ask a student to tell the class what the first step is. They then ask another student to tell the class what the first student said. This repetition encourages all students to listen and has the added benefit for English language learners, who may have difficulty in comprehending multistep directions, of giving them multiple opportunities to hear the directions. Partner talk is the bread and butter of a classroom filled with the talk of learning. Teachers most commonly invite students to "turn to a partner" to discuss the topic of the moment. As noted in Chapter 4, this simple partner-talk method should be used frequently to allow students lots of opportunities to apply new learning. But work accomplished in pairs is also done during collaborative learning activities designed to move students to an increased level of independence. In Chapter 3, kindergarten teacher Mr. Velez used the "busy bees" strategy to foster partner talk with his students as they shared their opinions about a recent visit to the zoo. This activity is suitable for children in kindergarten through 2nd grade. The teacher introduces the activity by explaining how bumblebees fly. The children, who are on their feet, mimic the buzzing sound and slow movement of bumblebees as they buzz around the room. With an announcement from the teacher of "Busy bees, fly!" the students shuffle their feet and buzz until they hear, "Busy bees, land!" The "bee" they are standing next to becomes their partner for a brief learning activity. For example, 1st grade teacher Ms. Tyler gives each of her students a few math cubes to hold in one hand, along with a sheet of paper and pencil attached to a clipboard. With each "landing," the partners add the total number of cubes and write an addition problem on their papers. Ms. Tyler uses this activity in place of math drill worksheets to provide practice for her students. Busy bees is not developmentally appropriate for older students, but a walking review accomplishes similar goals. Like the "Find Someone Who …" handout used for students to get to know one another, this activity is an excellent replacement for completing independent worksheets and for reviewing material. Each student in the class has a worksheet to be completed and is given a limited period of time to find someone else in the class who can answer each question. Students sign their names next to each answer they log onto someone else's worksheet, and no one can provide more than one answer on any given paper. The goal of this activity is to encourage students to speak to as many classmates as possible about the concepts under review. Mr. Clark uses walking reviews every Friday in his 8th grade science class to review the week's lessons on chemical reactions. "This is a great way for me to use some of the worksheet materials that come with the textbook program," he explains. He sets the timer for 10 minutes and moves among the students as they roam the room looking for peers who can answer each question. To provide his English language learners with the support they need to approach fellow classmates, he meets briefly with those who need it to give them questions to ask (e.g., "Do you know the answer to number 3?"). When he has students who are very new to English, he partners them with another student to walk the room. "I get a really good sense of who knows something and who doesn't," he says. Mr. Clark asks students to complete the last question on the paper independently back at their desks. "As they all drift back to their seats, the room gets quieter, and I can gauge how much more time might be needed. And don't forget, it gets everyone back in their seats!" As with busy bees and walking review, this instructional routine also requires students to move about the room. However, this approach offers a bit more crowd control because only half of the students are in motion. The teacher begins by reminding students about the differences between explorers, who sought out new lands, and settlers, who cultivated the land and built permanent communities. Assign half of the students to the role of explorers (a good way is to divide the alphabet by last name), and explain that they will seek out settlers to discuss a question. Discuss the ways of life of the Pueblo Indians of the Southwest. Discuss the ways of life of the woodland peoples of the East. What did these two groups have in common? How did geography influence their different ways of life? Ms. Lee used a countdown timer for each question so that the partners could monitor their discussion. As the timer approached zero, she invited the explorers to find a new settler and directed them to the next question. There are variations of the explorers/settlers theme, including couch potatoes/aerobics instructors (physical education), electrons/protons (science), and carriers/borrowers (mathematics). Purposefully planning when using this strategy can scaffold language for students who are learning English. You can, for instance, assign students at early levels of proficiency to be explorers and then assign the settlers to be the first ones to speak. This approach provides an opportunity for English language learners to hear the language of other more proficient students and rehearse what they might say before they have to speak. When you ask them to repeat the process, it provides multiple opportunities for them to hear and use language related to the same question. In Chapter 3, Ms. Schmidt used inside/outside circles during her lesson in her 5th grade social studies class. This strategy also requires student movement and is intended to extend thinking through multiple conversations. Two concentric circles of students stand and face one another. The teacher poses a question to the class, and the partners talk for a brief time (usually 30–60 seconds). At the signal, the outer circle rotates one position to the left to face a new partner. The conversation continues for several rotations. Mr. Garland uses inside/outside circles in his 10th grade English class to get discussion going about a thought-provoking question. "You've got to ask a good, meaty question," he cautions, "or they'll run out of things to say pretty quickly." His class will be reading a variety of titles to explore the essential question "When does the desire to obtain something or someone become destructive?" For several minutes, students explore this idea with a series of partners, while Mr. Garland listens in on the conversations. "It helps me to make connections to books I am going to discuss with them, and reminds me of what's in the heads of 15-year-olds." Mr. Dare requires the students in his woodshop class to be able to correctly name each type of equipment used in the class. He assigns partners and places a low cardboard shield on the desk so that they cannot see the cards the other holds. One partner has an unlabeled photograph of a piece of shop equipment, while the other has written descriptions of each. The partners work together to describe and match each photo with its correct name and purpose. Only after students have completed this task are they allowed to operate any of the equipment. Some instructional tasks require the give-and-take of a slightly larger group of students. Collaborative learning among four students is a bit more active than partner activities, so the noise meter is useful when setting up these tasks. In addition, group tasks tend to be a bit longer than those accomplished in pairs, so a display of elapsed time gives students a way of monitoring their progress and adjusting their rate of work. A jointly produced final product is useful for group tasks because it gives all the members a shared focus. However, a common problem is that these tasks often fall to one member who does all the writing (and, therefore, much of the thinking). An easy solution is the collaborative poster discussed earlier in this chapter, where each member of the group is given a pen of a different color and all sign their names accordingly. Ms. Chang uses collaborative posters in her geometry class to get academic discourse and technical vocabulary going. Each group uses theorems to analyze an equation and produce a proof. As Ms. Chang circulates among the groups, she can immediately evaluate the level of participation within the groups and offer extra support to those who do not seem to be sharing their ideas as effectively. This instructional routine was developed by Eliot Aronson in the 1970s to support the efforts of a recently desegregated elementary school in Texas. The original intent was to foster cooperation among students who did not associate much with one another, but Aronson (2000) and his graduate students quickly learned of the academic benefits to this approach. Each student in the class has two memberships: a home group and an expert group. Each home group of four members meets to discuss the task and divide the work according to the teacher's directions. For example, a long reading might be divided into sections. After each home group member has his or her task, the groups move to expert groups composed of members with the same task. The expert groups meet to read and discuss their portion of the assignment and practice how they will teach it when they return to their home groups. Once together again, each student teaches his or her portion of the task to fellow home group members and learns about the other sections of the reading. In what ways does Stanley Yelnats change throughout the story? Is he a better person? Is Stanley a hero, or is he just a person who makes good choices? What's the difference? Why do you think the author entitled this book Holes? Do you think that the Yelnats family's bad luck was due to a curse or something else? Ms. Armstrong's students joined expert groups to discuss their assigned question at length and debate various ideas raised during the conversations. After 15 minutes, they rejoined their home groups to discuss all four of the questions as each member took a turn facilitating the dialogue. Although the focus of this book is oral discourse in the classroom, we are reminded that oracy and literacy are inextricably intertwined. We use talk to prepare students before they read or write, to enhance comprehension and improve writing, and to encourage reflection and self-monitoring after reading or writing. Perhaps most important, we use talk as a means of engaging students in high levels of critical thinking. As we saw in Chapter 3, opportunities for talk are continuously and seamlessly integrated into opportunities to read, write, and think. Let's take a look inside Ms. Zamorano's 1st grade classroom to see how her students engage in listening, speaking, reading, writing, and thinking. It's October, and hurricane season is just ending. Ms. Zamorano's students have been learning about weather and how it affects the way people live. While part of the class is working in pairs to write a description of what happens during a hurricane, Ms. Zamorano pulls a small group of English language learners aside for a language experience activity. These are students at fairly early levels of proficiency who mostly speak in short phrases or sentences. The students begin by looking at a picture of a tree-lined street along the beach. The wind is blowing, the waves are large, one tree lies across the street, and a man and a boy hold hands as they cross the street. Ms. Zamorano asks the students to think for a minute about what they see in the picture, what has just happened, what is happening now, and what they think will happen next. She sets up her questions to elicit vocabulary as well as to teach and practice present, past, and future verb tenses. Together, partners tell each other what they see in the picture. Some students are speaking in isolated words ("Man," "Boy," "Tree"); others string their words together in short phrases ("Tree fall down," "Two people run"). Each student is able to participate at his or her own level of language. Ms. Zamorano draws a circle in the middle of a piece of chart paper and writes the word hurricane in the circle. Then, as the children share what they see in the picture, she writes their words around the circle, grouping the words in categories of things, actions, and feelings. The students practice the pronunciation of the words with Ms. Zamorano, and then they work with their partners to make sentences using the words. As students share aloud their sentences, Ms. Zamorano writes them on the chart. Although she uses their language, she does model correct grammar, asking students' permission before she writes the revised sentence and then asking students to say each sentence with her. She helps them expand their sentences by asking questions to elicit more detail. Because she wants them to write a narrative, she guides them to group the sentences that fit together and then to sequence them chronologically. On another chart, she rewrites the sentences into the sequence the students have chosen. They read the paragraph aloud and then copy it into their journals. Later, during learning center time, they will reread the paragraphs, cut the paragraphs into sentences and the sentences into words, and then put them back together. The sentences are also used for practice in changing verb tense or adding different sensory words. The paragraphs are collected into a book for students to read during independent reading. The beauty of the language experience approach is that it uses the students' own language and thinking to expand their language and thinking. Students learn to read and write what they can say and understand. They add to the language they already know. It can be used at any grade level, with students of any proficiency level, as a way to model and guide writing about any topic in any genre or discipline. Although the management associated with promoting talk in the classroom can be significant, it is well worth the investment. If students are to benefit from the academic discourse, they must become practiced in engaging in it outside the direct supervision of the teacher. This means that the tasks must be organized and have a clearly stated purpose. In addition, the tasks themselves must be sufficiently interesting so that students will want to invest their time. The collaborative learning that occurs in classrooms rich in talk most closely mirrors the kinds of conversations that will dominate students' postsecondary lives. It seems that it is never too early, or too late, to foster language among learners.